This is my favorite summertime dinner. If you use the right techniques, it is really fantastic and fast. It's 'low-carb' too. Unless you pair it up with a bottle of white wine. On your way home from work, swing by the store and grab a few chicken breasts of the same size (bone in/out and skin on/off is entirely up to you) and a bundle of asparagus. If you don't have fresh lemon and garlic at home, pick up some of those too. Put your chicken in either a big ziplock bag or a pan to marinate. Prep the asparagus by washing and snapping off the bottoms, lay out in a pan. In a small bowl—combine the following and pour most of it on to the chicken, the rest on to the asparagus. Let this all sit a few minutes for a quick and fresh marinade. Salt – not too much! Sea salt is really good here, but a little goes a long way. Throw the chicken on a hot (med-high) grill. Wait about 5 minutes (good dark grill marks), flip the chicken, and put the asparagus on a low-medium heat. These veges always cook slower than you think- I expect them to be done in two minutes but they take actually probably closer to 5-10 minutes. The chicken may take 15, so that’s why we put it on first. 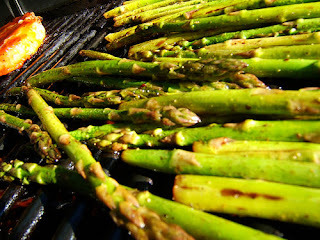 With the asparagus, we’re aiming to create a nice charred taste, with minimal blackness. If you stick them on higher heat, they’ll become completely black. If you like them a little raw, don’t let them wilt too much, or if you like them fully cooked, wait until they flop when you pick one up. Here’s what I have learned about grilling meat: don’t ever, ever use a fork or knife– use tongs or a flipper. If you break the outside crust you’ll lose juice the entire rest of the cooking time. And tongs make a great meat thermometer. When you squeeze, does the meat have any give? If it is really firm, it’s way overcooked. If it squeezes and seems jiggly, it’s raw in the middle still. Squeezing your meat isn’t bad for it at all so play with this. Love it. Learn it. Live it. And how will you know when it is done? Basically this is a big learning curve thing. So you pull it off and it’s raw? Well, raw is better than overcooked, because you can’t fix overcooked. Before you celebrate and sit down to eat, give the chicken a good 5-minute rest. Open that bottle of wine. Spray a little more lemon over the asparagus and chicken. Or get fancy and garnish with a bit of fresh tarragon or basil. Delishhhh.